In the new year, it is the custom to have Osechi Ryouri. we are still taking reservation for our guests who will be staying in New Year Time. For more details please email us or ask at the reception. 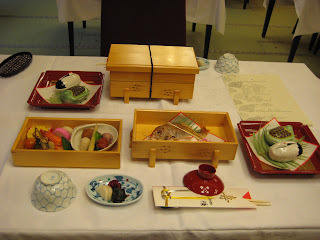 This is Kaiseki Ryouri for the beginning of 2009. I went to Arashiyama Hanatouro last thursday. I took Randen the only tram train (in certain area only) remains in Kyoto. It was really cold night however many people were there to see the light-ups. I only went to Horinji-temple and Bamboo footpath. It had different outlook from during the day. Horinji has a terrace where you can have good view of Kyoto. Unfortunatelly theres no picture of that but it is worth going. Bamboo Footpath. There were few other colours lighted up, but I thought blue was the best. There are Hanatouro at Higashiyama area this coming March as well. If you are in Japan this time, please go and see roads and temples lighted up beatutifully. I went to see Fushimi Inari Shrine and Fushimi Momoyama area few days ago. Fushimi Inari Shrine is one of the popular place where our guests ask us how to get to there. I made route guide album for these areas so please have a look. It is in the bookcase of lobby. The town still has the traditional look. From today, 11th December to 20th December in Arashiyama area Hanatouro illumination will be held. 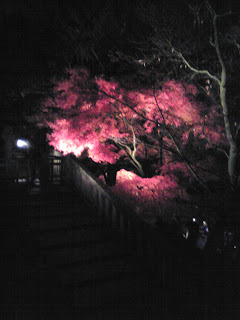 Pathways of Arashiyama area are illuminated every night and also things like street performance and Ikebana displays are held during this event. During this event the traffic will be restricted so please use public transport to get to Arashiyama. 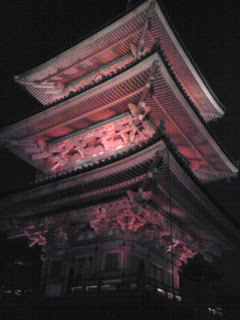 I went to Kiyomizudera-temple light-up last thursday. During light-up is held usually the temple gets crowded and especially on weekends. no many people were there. 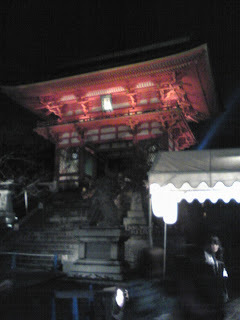 I caught the bus from Kawaramachi Marutamachi stop, which is the closest stop to get to Kiyomizu temple from our ryokan. Take #202 from the Kawaramachi Marutamachi stop and get off at the Kiyomizumichi stop. It took about 20mins, but during the tourist season it might take more. From the stop, have to walk up the hill for about 10mins. There are many shops towards the Kiyomizu temple, you might find something interesting there. The leaves are slightly dump after the rain so when its lit up it sparkles very beautifully. Also the full moon were showing between the clouds and it adds the beauty to the whole atomosphere. It took about 50mins to walk through the whole temple. I went there with my friend and we took a walk towards Gion area through stone laid walkway. This area still has traditional walkway and it is one of the main attraction for tourists. I reccomend to take a walk from Kiyomizu to Gion area after going to Kiyomizu temple. 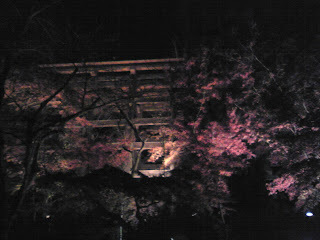 Unfortunatelly, Kiyomizu temple's light-up finished already but the Shorenin still hold the light up until December 14th. Its already December and getting towards the end of 2009 and the New Year 2010. We hold these events at our Lobby. Japanese style Tea Ceremony held with English narration. You can make your own tea in the ceremony. Also called KAKIZOME in Japanese. experience how to write Japanese Caligraphy. This is whats it looks like last year. Both events are always enjoyed by many guests staying at our Ryokan. It is for Free so when you stay above dates at our Ryokan, please come along.